Blockchain is one of the most discussed and intriguing technologies out there today. I will not go too deeply into the specifics of how it works since that has been covered by many other sources. Suffice to say that it is a huge, global distributed ledger or database running on many devices and open to anyone within the blockchain. In the Blockchain, information, or anything of value can be stored. Its purpose is to ensure a 100 percent secure, verifiable and traceable database protocol. So far, most use cases have been focused on the financial sector, including transaction management where costs are reduced by keeping property ownership and records or using it to track high-value goods, such as diamonds. 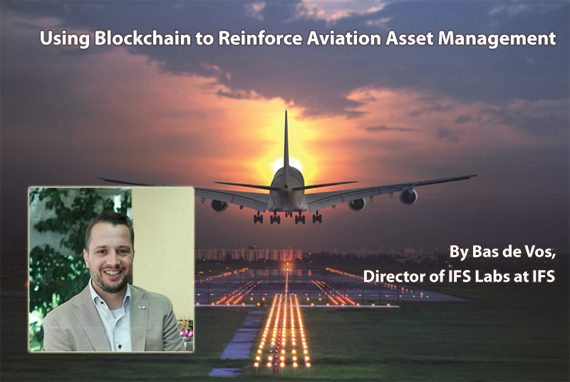 There is, however, a huge untapped market in asset management—specifically in the commercial aviation industry. A modern aircraft consists of roughly 2–3 million parts. It is crucial to know the provenance of these parts, i.e. original manufacturer and exact product model and version, in order to ensure they have the right specification and that they are not counterfeit. In addition, many of these parts are so-called “tracked items.” Not only their provenance, but the entire maintenance history of these parts needs to be transparent. Today, the many participants in an asset’s lifecycle—from manufacturers to transporters, maintainers and operators—each have their own disparate systems for managing assets. Consequently, it’s quite difficult to establish and maintain a single version of the truth when looking at that asset’s entire lifecycle. Often, these records can be incomplete or non-digitized, where communication between the different participants is often conducted on paper or even verbally. Lack of standardization leads to limited traceability and the cost for non-compliance can be high. But what if all of these participants submitted a transcript of the transactions into a purpose-specific, distributed ledger—like blockchain—which only authorized participants would have access to? Using blockchain for this asset management scenario would give you a 100 percent verifiable, traceable and trustworthy history of the asset’s lifecycle in real-time. Each individual participant in the chain still has the features and benefits of their own business applications to run their business.